WebCheck lets you review, edit and approve your translations quickly and efficiently online. You simply edit the file online and your comments and edits are then available directly to our translation team for updates. Integrating your review process with our translation system helps technical publication managers and marketing teams deliver projects faster. If you choose to use your own reviewers for your translation review process then you have a number of approaches to choose from. The most cost effective approach is to use our WebCheck system which allows your reviewers see the translation in sync with the source English text. Your reviewers can make edits and make changes online which will be implemented by STAR. Alternatively, you can send us PDF files with electronic edits and feedback from your team. STAR will review your feedback and update the translation. This is the most time consuming process. WebCheck simplifies the process and enables you to track every single change in your files before publication. How do we know if it will take longer than 20 minutes? This time depends on the complexity of your files and the changes that are expected. Our sales team will send you a quote for your project. Our most popular solution for clients who want the highest quality translation. Your reviewers work with STAR to review, update and complete your translation. When you just have a few minor edits to make and are looking for a cost effective solution to quickly review your translation choose the WebCheck Silver service. For clients who prefer to work offline we can update your changes from electronically edited PDFs and word files. As this is a manual task we assign our translation editing team to process your edits and charge on an hourly basis. We implement your suggested changes and update your translation memory*. We finalize the layout of your files so they are ready for you to print. 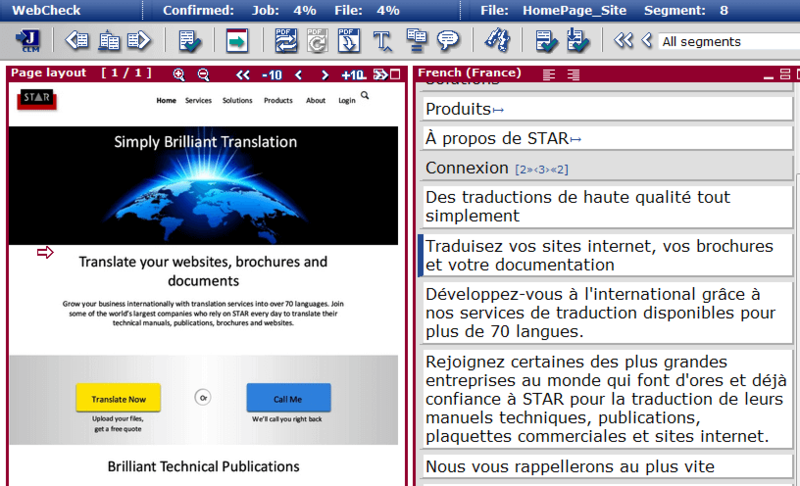 STAR loads the translated files online and grants you access to them. After logging in, your reviewer can see your translations side by side with the source content. You work directly on the translated files making comments, amendments and edits. The user-friendly interface makes reviewing your translated documents in WebCheck very easy and fast. The synchronised bilingual display helps improve the accuracy of the review. The synchronised display helps improve the accuracy of the review. 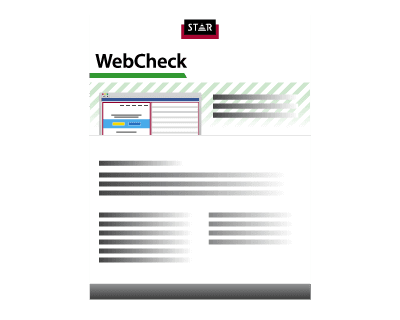 WebCheck provides a direct interface into STAR’s working format. Once your reviewer inserts their changes and they are checked by our translation teams, your preferred translations are immediately saved and stored for reuse in future translations. This eliminates the need for time-consuming, manual PDF changes, and reduces the costs of rework. WebCheck simplifies your review process: it avoids the overhead of file exchange during the review stage, tracks the changes added automatically and centralises all the files needed for review on a single platform. This guarantees faster execution of the review phase and projects overall. You can check your files at any time from any computer. All you need is Internet access as WebCheck works in your web browser. There is no need to download and store original and translated files locally to edit them. This eliminates the risk of working with outdated versions. All your projects files, no matter how many there are, are stored and easily accessible in WebCheck. Several projects can also be loaded simultaneously. Previously translated text or Segments are visibly marked with a grey background so you don’t need to spend time reviewing segments previously approved. Easily identifying such segments helps you guarantee the consistency of your messages and thus strengthens your brand image. Especially for brochures, flyers and catalogues. The translation will appear in sync with the source material so that you can easily see where the text will appear in your document. The main edit window shows you the final version of your files so that you have a clear view of what your final translation will look like. Direct integration back into Transit NXT our translation system: corrections are implemented faster, eliminating time consuming manual copying and pasting. The WebCheck review is available immediately after translation: no additional delay is incurred producing draft PDFs for review.